We have received a case where a group of young people flagged down a vehicle that was being driven by a Muslim who was wearing a Muslim prayer cap. The young men were walking along a street and shouted something to the victim and carried on trying to flag down the victim’s vehicle, leading to him slowing down and coming to a stop. As they came close to the vehicle, the Samaritans suggested that the rear tyre of the vehicle was flat. The reality was that these were no good Samaritans and as soon as the victim got out to check his tyre, three individuals attempted to assault him with a glass bottle. As the victim raised his hand to protect himself, he suffered injuries to his hand as the individuals then ran away. He was also called a terrorist, in direct relation to the Manchester terrorist attack. The victim blacked out after the attack and sought medical attention for the assault on himself. We would urge that individuals exercise some caution at this sensitive time and report anti-Muslim incidents into Tell MAMA. Serious assaults should be reported to the Police and to Tell MAMA since we also provide support services to victims, as well as casework, legal advice, signposting and advocacy services. We have been informed that a Glasgow based business owner woke up to see ‘IS’ or Islamic State scrawled on the rear of the business unit. The graffiti was removed by the local authority, yet coming to work and seeing such graffiti scrawled onto a local business leaves the impression that an individual or group of individuals have ‘marked out’ that business through their hatred and intolerance. Glasgow is an area where we get reports in from and if you are targeted by such an incident, we can help to get the graffiti removed. We can also provide direct support through casework assistance, legal advice, signposting and emotional support. Egyptian fighter jets carried out strikes on Friday directed at camps in Libya which Cairo says have been training militants who killed dozens of Christians earlier in the day. Islamic State supporters reposted videos from earlier this year urging violence against the Coptsin Egypt. 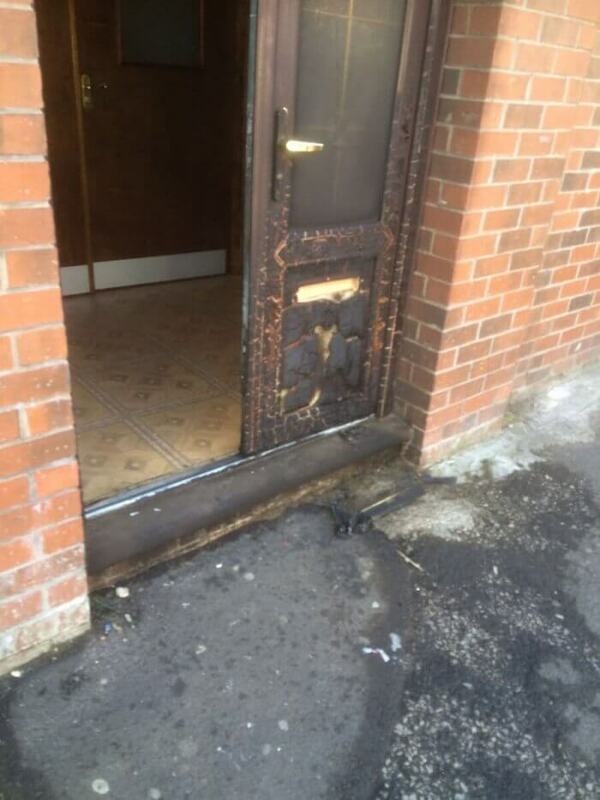 Officers used a controlled explosion to gain entry to the address in the north of the city where the latest arrests were made. Detectives are now questioning 11 men over the attack by Salman Abedi at a pop concert in Manchester on Monday. A man working in a local shop, who declined to be named, told Reuters he saw three men being taken away from the address. “As part of an ongoing search at a property in Moss Side an evacuation is currently being carried in the area,” police said in a statement. While Britain’s most senior counter-terrorism officer said police were confident that they had made “immense” progress and had apprehended a “large part of the network”, extra armed officers will be on duty across the country with security stepped up at some 1,300 events over the long holiday weekend. Britain remains on its highest threat level of critical, meaning an attack is expected imminently, with the army backing up police and hospitals across the country have told staff to be ready for another incident. The Times newspaper reported on Saturday that intelligence officers had identified 23,000 jihahist extremists living in Britain. Earlier this week a source with knowledge of the matter told Reuters the security services were managing 500 active operations involving some 3,000 people who were thought to pose a threat. However, Assistant Commissioner Mark Rowley, the UK police chief for counter-terrorism, advised people to be vigilant but to “go out as you planned and enjoy yourselves”. While police and politicians have praised communities in Manchester for their reaction to the bombing, Greater Manchester Police Chief Constable said there had been a rise in reported hate crimes, from an average of 28 to 56 incidents on Wednesday. “I want to make one thing very clear to Jeremy Corbyn and to you, and it is that there can never, ever be an excuse for terrorism,” she said at a summit of Group of Seven leaders in Sicily. 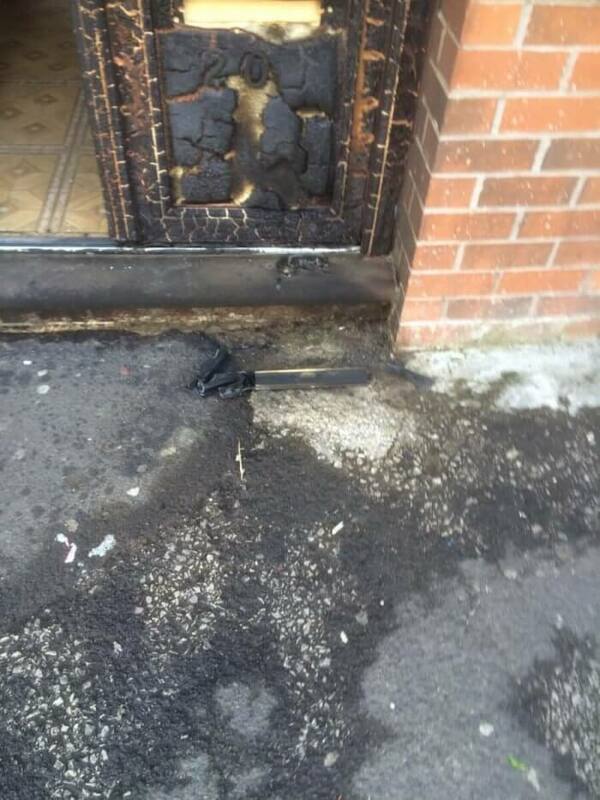 Arsonists targeted the Jamia Qasmia Zahidia Islamic Centre in Oldham within hours of the Manchester terror attack in a suspected anti-Muslim ‘revenge’ attack, according to the MailOnline. Nobody was inside the building during the incident. A close-up of the damage. Credit: Tell MAMA. A local Tell MAMA Outreach Officer spoke with locals who stated an individual had been spotted near the door, but nobody has seen the fire begin. It was later confirmed that a taxi driver had spotted the fire and had dialled 999 between 2:00 am and 2:15 am on May 23, adding that CCTV footage had captured the offence. The fire has shocked residents who spoke of the good community relations between different faith groups. An example of this included a local resident stopping her car near the mosque and offering her assistance. Aqil Ahmed, the former head of religion at the BBC and Channel 4, tweeted: “Crazy thing is a childhood friend of my daughter was at that concert. A Muslim”. Others flooded Tell MAMA’s Facebook page with comments condemning the act and posting messages of tolerance and solidarity in the wake of Monday’s tragic terror attack. Various trolls on 4Chan suggested that the arson was an ‘insurance job’. Our safety leaflet for mosques is available online. We have mapped over 100 anti-Muslim incidents against Islamic institutions since May 2013. If you have any information regarding this incident we urge you contact Greater Manchester Police via 101. Or, report to our confidential service using our online form or calling our freephone 0800 456 1226. 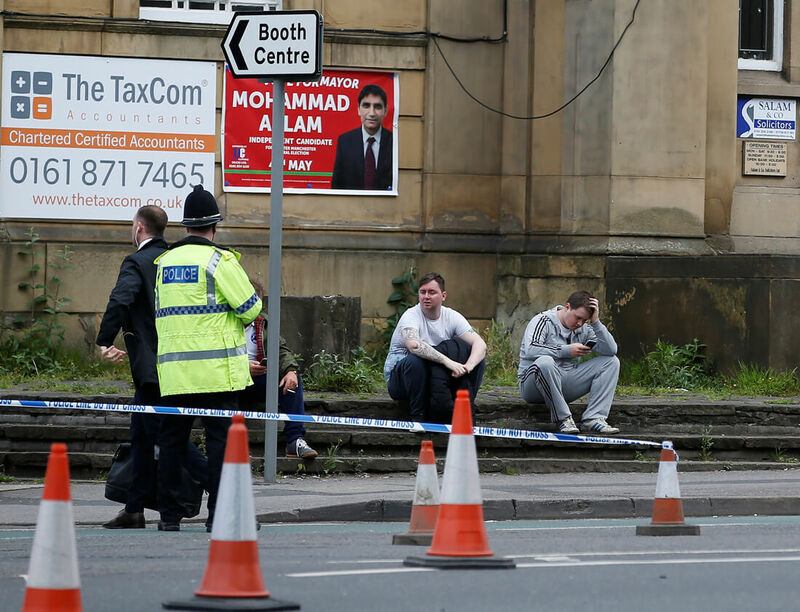 22 people have lost their lives after the terrible suicide attack in the early hours of the morning in Manchester. Last night, emergency services, the police and communities came together to try and support those who were targeted. The end result was that the nation woke up to see emergency procedures kick in within Manchester and with investigations underway. There is intersectionality between extremism and hate crime. Far right anti-Muslim hate has extremist rhetoric that is associated with it, as does Islamist extremism which promotes a separationist view of people and communities. There is a strong likelihood that the suicide bomber involved in the terrorist attack in Manchester, was influenced by Islamist extremist narratives and rhetoric. This is why this rhetoric must be challenged and robustly challenged, when there are groups feeding into it and fanning the flames of views which include ‘Muslims being targeted by the State’ and ‘Islam being under attack’. Such rhetoric is toxic and is poured out by some groups. Hate crime work involves empowering the victim. Only by empowering people, can extremist narratives be challenged. Those who play to fears and paranoia in our country are not part of the solution, but are part of the problem. President Donald Trump urged Arab and Islamic leaders on Sunday to unite and do their share to defeat Islamist extremists, making an impassioned plea to “drive out” terrorists while toning down his own harsh rhetoric about Muslims. The U.S. president did not use his signature term “radical Islamic terrorism” in the speech, a signal that he heeded advice to employ a more moderate tone in the region after using the phrase repeatedly as a presidential candidate. “Terrorism has spread all across the world. But the path to peace begins right here, on this ancient soil, in this sacred land,” Trump told leaders from about 50 Muslim-majority countries representing more than a billion people. He portrayed the conflict as one between good and evil, not between civilizations, and made clear in a forceful tone that Washington would partner with the Middle East but expected more action in return. The advance excerpts of the speech had him saying “Islamist extremism.” A White House official blamed Trump’s fatigue for the switch. “Just an exhausted guy,” she told reporters. The term “Islamist extremism” refers to Islamism as a political movement rather than Islam as a religion, a distinction that the Republican president had frequently criticized the administration of his Democratic predecessor, Barack Obama, for making. As a candidate, Trump proposed temporarily banning Muslims from entering the United States. In office, he ordered temporary bans on people from several Muslim-majority countries, which have been blocked by courts that ruled they were discriminatory. The speech in a gilded hall bedecked with chandeliers is part of an effort to redefine his relationship with the Muslim world. Trump’s “America first” philosophy helped him win the 2016 election and has rattled allies who depend on U.S. support for their defence. Trump received a warm welcome from Arab leaders, who set aside his campaign rhetoric and focussed on his desire to crack down on Iran’s influence in the region, a commitment they found wanting in Obama. Trump did not make overt mentions of human rights abuses in Saudi Arabia or the other Gulf nations in his speech. White House officials has said he did not want to lecture, something they believe Obama did, unsuccessfully. Iranian Foreign Minister Mohammad Javad Zarif fired back at Trump in a tweet that Trump had attacked Iran in “that bastion of democracy & moderation” of Saudi Arabia and suggested he had “milked” his hosts for hundreds of billions of dollars in business deals. Iran is a Shi’ite Muslim country. The groups the United States has been fighting in Afghanistan, Iraq and elsewhere since the Sept. 11, 2001, attacks on Washington and New York are mostly Sunni Muslims, and enemies of Iran. Iranian-backed militia are also fighting Islamic State militants in Iraq. He praised Egyptian President Abdel Fattah al-Sisi, telling him: “You have done a tremendous job under trying circumstances.” The Obama administration had a difficult relationship with Sisi, who came to power after leading a military coup in 2013 during which hundreds of demonstrators were killed, and has since jailed thousands of opponents. The king lauded the relationship and said it had led to “great stability in the region and prosperity.” Bahrain is home to the U.S. fleet in the Middle East. Its Sunni Muslim royal family rules over a majority Shi’ite population and was occasionally rebuked by the Obama administration for harsh treatment of opponents. Trump’s Riyadh visit kicked off his first presidential trip abroad, with Saudi Arabia the first stop on a nine-day journey through the Middle East and Europe. Soon after Trump embarked on his trip on Friday, he was hit with more accusations that, with Comey’s firing on May 9, he was trying to squelch a federal investigation into his campaign’s ties with Russia last year. A lawyer for Jonathan Pollard, a former U.S. Navy intelligence officer who served 30 years in prison after being convicted of spying for Israel, on Wednesday urged a U.S. appeals court to loosen his parole conditions. Lawyer Eliot Lauer argued to a three-judge panel of the 2nd U.S. Circuit Court of Appeals in Manhattan that the conditions, which require Pollard, 62, to wear an electronic tracking device, adhere to a curfew and submit his computers to monitoring, serve no legitimate purpose. Pollard, who attended the hearing with his wife, pleaded guilty in 1986 to conspiracy to commit espionage in connection with providing Israeli contacts with hundreds of classified documents he had obtained as a naval intelligence specialist in exchange for thousands of dollars. He was sentenced in 1987 to life in prison. After serving 30 years, which included time in custody following his 1985 arrest, Pollard was released on parole on Nov. 20. He now lives in New York City, and his lawyers say his parole conditions have prevented him from having a job. As part of his parole, Pollard must remain in the United States for five years. He has sought to move to Israel, where his wife lives and where he was granted citizenship while in prison. Israel had long pushed for his release. Lauer said Wednesday there was no rational basis for the government to think Pollard “might retain details in his head about documents created 32 to 33 years ago” that he could disclose. Circuit Judge Reena Raggi, however, pressed Lauer to explain why Pollard’s crime was not enough to justify the conditions. “Why is it the government’s obligation to take the chance that he’s forgotten something and it pops into his mind, or he does retain it?” she asked. Lauer responded that there must be some rational basis for the government’s position. Tinio also emphasized the “enormous harm to the United States” Pollard caused, noting that former U.S. Director of National Intelligence James Clapper had submitted a letter stating that documents compromised by Pollard remained highly classified. The post U.S. court urged to relax convicted Israeli spy’s parole conditions appeared first on Faith Matters. King Salman gave Trump a remarkably warm greeting, meeting him at the steps of Air Force One on arrival, shaking the hand of Trump’s wife, Melania, riding with Trump in his limousine and spending most of the day with him. But the political turmoil back in Washington consumed the headlines in the United States and cast a long shadow over the start of Trump’s trip, which will include stops in Israel, the Vatican, Italy and Belgium. His firing of Federal Bureau of Investigation head James Comey on May 9 and the appointment of a special counsel to investigate Trump’s 2016 presidential election campaign ties to Russia have raised the question of whether he tried to squelch a probe into allegations of a Russian connection. Fanning the flames was a New York Times report that Trump had called Comey a “nut job” in a private meeting last week in the Oval Office with Russian Foreign Minister Sergei Lavrov and ambassador Sergei Kislyak. The Times quoted briefing notes of the conversation. Amid a mood of frustration, officials on board Trump’s Riyadh-bound presidential plane scrambled to coordinate on responding to the story with staff in Washington and those who had just landed in the Saudi capital. Russia’s Interfax news agency on Saturday quoted Lavrov as saying he had not discussed Comey with Trump. “We did not touch this issue at all,” the minister said. In another development, the Washington Post said a White House official close to Trump was a significant “person of interest” in the investigation into possible ties with Russia. Tillerson, asked about the story, said he did not know who the “person of interest” was. Against that backdrop, Trump soldiered through a long day of diplomacy. Saudi foreign minister Adel al-Jubeir called the results of Trump’s meetings with Saudi King Salman bin Abdulaziz “the beginning of a turning point” between the United States, Saudi Arabia and its Gulf allies. Both he and Tillerson made clear the arms deal was aimed at countering Iran on a day that Hassan Rouhani was re-elected as Iran’s president. Tillerson said Rouhani should use his second term to end Iran’s ballistic missile testing and stop promoting extremism in a volatile region. Trump’s trip has been billed by the White House as a chance to visit places sacred to three of the world’s major religions, while giving him time to meet with Arab, Israeli and European leaders. King Salman gave a more favourable welcome to Trump than he had granted last year to Trump’s predecessor, Barack Obama, who was seen in the Arab kingdom as soft on Iran and hesitant on Syria. Trump and King Salman seemed at ease with each other, chatting through an interpreter. At the royal al-Yamama palace, the king draped around Trump’s neck the King Abdulaziz medal, the country’s top civilian honour. At the end of the day, Tillerson and U.S. Commerce Secretary Wilbur Ross, holding swords, were seen participating in a ceremonial dance at Marraba Palace with a Saudi group. As Trump arrived for dinner with the king, a spectacle awaited him: Men dressed in long white turbans and carrying swords swayed and chanted in unison to beating drums in a courtyard. Trump, clearly enjoying himself, smiled and swayed, even seeming to dance a little at the centre of the group. During their conversation earlier in the day, the king was overheard lamenting the Syrian war. Trump ordered air strikes against a Syrian airfield in April in response to a chemical weapons attack by government forces against civilians. “Syria too used to be one of the most advanced countries. We used to get our professors from Syria. They served our kingdom. Unfortunately, they too brought destruction to their own country. You can destroy a country in mere seconds, but it takes a lot of effort,” he said. Trump’s response could not be heard. The arms package includes a pledge by the kingdom to assemble 150 Lockheed Martin & Blackhawk helicopters in Saudi Arabia, in a $6 billion deal expected to result in about 450 jobs in the kingdom. National oil giant Saudi Aramco was also expected to sign $50 billion of deals with U.S. companies on Saturday, part of a drive to diversify the kingdom’s economy beyond oil exports, Aramco’s chief executive Amin Nasser said. U.S. technology and engineering conglomerate GE said it had signed $15 billion of agreements with Saudi organisations. The post $110 billion arms deal with Saudi Arabia – Donald Trump appeared first on Faith Matters.